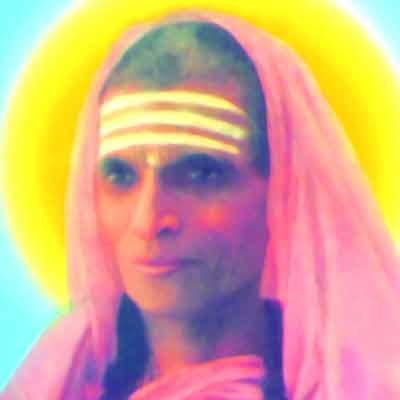 Ja Ca Ni is the abbreviated form of Veerashaiva Saint Jagadguru Cannabasavaraja Desikendra Shivacharya Mahaswamiji, Nidumamidi Samsthana, Guluru (1908 – 1996). He was a creative writer and researcher with more than 200 works to his credit including Vachanas, essays, biographies, poetry, plays and critical works on philosophy. He wrote in Kannada and Sanskrit. He upheld Dasoha, self subjection to a deity or man, and astravarana, eight coverings to protect a devotee. As per his teachings, Brahma, Vishnu and Shiva stand for creation, preservation and transformation. The trinity represent omkara roopa. In Aum, rudra is indicated by A, Vishnu by U, and Brahma by M.
He rejected all kinds of caste and color discrimination. He taught that one may become Brahmin, Kshatriya, Vaishya or Shudra through one’s character and profession. Jagadguru Cannabasavaraja Nidumamidi states that Rudra, Bhadra and Shiva are pioneers of religious harmony in India, fighting for the unity of Aryan and Dravidian races. According to him Shiva and Shakti is so universal that it is impossible to restrict them within the four walls of a temple. He is the creator of nature. Prakriti, Goddess of nature, shines everywhere with her desire, action and prowess. Shiva created universe for his entertainment. Worship of Shiva helps an individual attain mukti or emancipation. Jivana Siddhanta, a work based on Siddhanta Sikhamani, originally written in Sanskrti by Shivayogi Shivacharya, is a significant literary contribution of Ja Ca Ni. This work is considered the soul of modern Virashaiva philosophy. Satakatarya Pravachana and Samapadaneya Sampu based on Satakatraya and Shunya Sampadane are two other important literary works.